When we say BIG TIME contains 60g of protein, we really mean 60g of protein. Absolutely no amino-acid spiking or cheap fillers to give you a false number. Whole protein is what your body needs to get the full 9 essential amino acids for muscle repair after a hard day’s work in the gym. Amateurs eat anything and everything to gain weight. But you’re an elite athlete - you know better. A high-calorie + clean-calorie supp is what you want. BIG TIME gives you exactly that: quality & quantity. Think 900+ calories from real food sources like quinoa, sweet potato, and inulin. Sugar – it’s bad for your gut and body. BIG TIME contains only 9g of sugar per 4 scoops. But, less sugar doesn’t have to equal boring taste. With 3 decadent flavours (Triple Chocolate Sundae, Vanilla Frosting, Cookies & Cream), you can enjoy amazing taste without the insulin spike. Determining your ideal carb-to-protein ratio is a tricky game. Many co-factors like body type, size, and weight are involved. But when it comes to bulking, a 2:1 ratio is the industry standard and we’ve stuck by it. Inflated ratios like 5:1 or 4:1 are nothing more than a cheap tactic to increase calories. Transform yourself into a powerhouse of strength with a quick dose (5g per 4 scoops) of the good stuff (Creatine). No matter what type of exercise you throw at your body, you will come out victorious. And once you get a taste of the good life, you’ll never go back. A surge in muscle mass equals a surge in muscle tissue. You can now be the lean, mean, muscle-making machine you strive to be. BIG-TIME helps build and repair tissue so that your body wakes up recharged, ready to repeat the drill in the field, arena, or gym. In the world of sports supps, nutrition is key but taste is king. With every product we create, we follow this crucial rule to score high on the flavour scale. Try our decadent flavours (Triple Chocolate Sundae, Vanilla Frosting, Cookies & Cream) and get hooked. Don’t be slowed down by a formula that takes forever to mix into your drink. BIG TIME gives you convenience with every scoop. Whether it’s 2 or 4 scoops – the formula mixes easily into liquid, helping you provide your body with the calories, fats, and carbs it needs to bulk. How is BIG TIME different from other gainers on the market? b) have an edge over everyone else. Many companies use amino-acid spiking to make it seem like their gainer has a crazy high protein score. Tempting? Absolutely. But before you spend your hard-earned money, know that these numbers are far from accurate. Amino-acids like creatine, glutamine, and taurine are used to increase a product’s nitrogen score (indicator of protein content). Companies can use this inflated number to advertise the protein content of their products. We make a clear distinction between our nitrogen score and actual protein content. 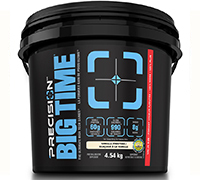 BIG TIME has 60g of complete protein and a 70g nitrogen score. The 10g difference isn’t due to cheap amino acid fillers but rather high-quality creatine, taurine, and other complementary ingredients. Also, the 900+ calories in every 4 scoops of BIG TIME come from clean, nutritious sources like quinoa, sweet potato, and flax seed oil. These carbs, fibres, and fats provide a strong basis for building muscle mass. Where do the fats and carbs in BIG TIME come from? Good fats from high-quality sources help you build muscle mass & muscle size. Bad fats? They just add pounds on the scale. BIG TIME provides 13g of high-quality fats from sources like MCT oils (medium chain triglycerides) and flax seed oil. This is what REAL bulking is all about. But to gain mass, you need more than just fats. You also need carbs. They’re what supply your body with the energy you need to build mass. Creating muscle tissue is taxing on your body so a solid source of macronutrients (like 150+ carbs) helps your body perform at optimal levels. The carbs in BIG TIME come from healthy sources like sweet potato and quinoa. What do you do to ensure an ethical and high-quality product? We know that you’re a committed athlete who doesn’t cut corners – you want your gains to come from hard work and hard work alone. Integrity is just as important to us. 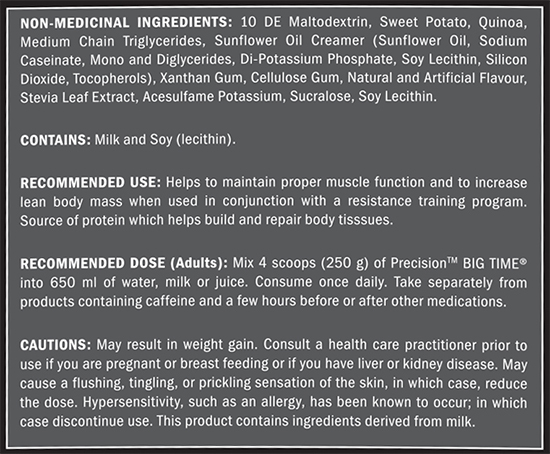 That’s why all of our supplements are manufactured in a Health Canada site-licensed facility that is 100% free of banned substances. Is there an age restriction I should be aware of? BIG TIME is safe for adults above the age of 18. If you miss a dose, don’t sweat it. Continue as outlined on the product label.